I have always loved seeing this widget on Android phones. 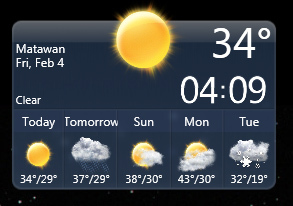 Now you can dress up your Windows desktop with the same weather widget. It offers many skins for different looks. It requires .NET, so I installed the portable version to get around those issues. It works and looks great! Windows XP users need not apply, you need Vista or Windows 7.